Construction has begun on an innovative learning facility designed to address regional and national deficiencies in science, technology, engineering, and math education. Next year, 200 elementary and middle school students will attend new John C. Dunham STEM (Science, Technology, Engineering and Math) Partnership School on the Aurora University campus. The STEM Partnership School will serve students in grades 3 to 8 from four regional public school districts; its curriculum will align with new educational standards. The four participating school districts, the university, and governmental, not-for-profit, and corporate partners-including Argonne National Laboratory, Fermilab, Caterpillar, Waste Management, Nicor Gas, and Tellabs-have worked cooperatively to plan facilities. The fields of science, technology, mathematics, and engineering are important economic catalysts that move both industry and the service sector forward. Even as globalization makes these high-demand fields more important, the United States faces serious knowledge deficiencies in human capital surrounding these critical subjects. On the whole, many of today's students have not been achieving in STEM subject areas at the high levels necessary to compete for jobs in even the near future. In response to this national challenge, Aurora University and its community partners established the Mathematics and Science Education Center of Aurora University in 2009 through an award from the Dunham Fund. Under the leadership of the Institute for Collaboration of Aurora University, the Center has created an innovative model for mathematics and science education in a diverse urban community, and this model can be replicated across the country. "A hands-on education in math and science is important for our community's young citizens," says Aurora University President Dr. Sherrick. "It arms them with the tools they need to grow, achieve and succeed in life." The STEM Partnership School is the cornerstone of the Mathematics and Science Education Center. 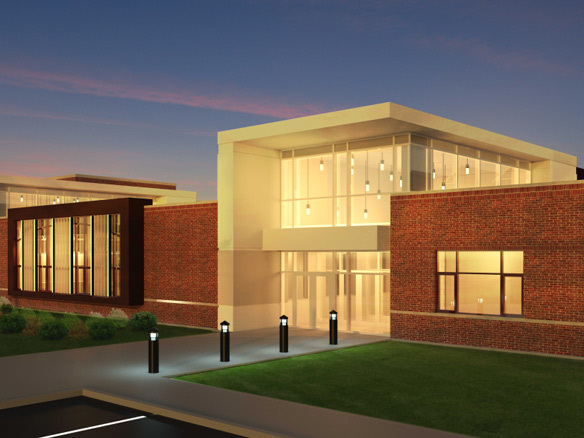 Designed by architects Cordogan, Clark & Associates, the new STEM School extends an existing campus building and includes a multipurpose room, visitor's center, eight classrooms, and six labs. The labs focus on different areas of science including energy, biomedicine, and biomaterials. Scientists and business leaders provided expertise in developing the labs. Nicor, for instance, played a significant role in the energy lab. Funding from a $3.5 million capital investment announced by Illinois Governor Pat Quinn, augmented with $9 million in private dollars, has recently enabled The STEM Partnership School to begin construction. "We must be sure that all of today's children are prepared and ready for the opportunities of tomorrow," Governor Quinn said. "STEM education is hands-on approach to learning that makes the classroom to come to life and allows minds to grow." The STEM Partnership School is expected to ignite passion for mathematics and science in the community's students. Equally important, the facility will serve as as a center for teacher preparations, faculty development, and educational research. Staffing is taking place through a professional development strategy that engages teachers from the partner districts as faculty while they complete graduate coursework in STEM fields in order to become leaders in mathematics and science education. Teachers from the four districts will serve two- or four-year appointments and have the opportunity to do additional graduate work in STEM areas of study. At the School they will also partner with businesses in the community on curricula and projects. Following their appointments at the School, the teachers will bring their experience back to their home districts. "It is clear that STEM education is essential in preparing our students for thriving careers in the global workforce," noted Aurora Mayor Tom Weisner. "The John C. Dunham STEM Partnership School at Aurora University will be the educational epicenter for Aurora's third through eighth grade students and their teachers who are leading the way." The innovative STEM Partnership School leverages the community as a laboratory to help create the workforce and leaders of tomorrow. Sherry Eagle, executive director for the Institute for Collaboration at Aurora University, hopes the school's curriculum, and even the school itself, will be copied across the state and even the nation. "That would be the biggest compliment," she said.